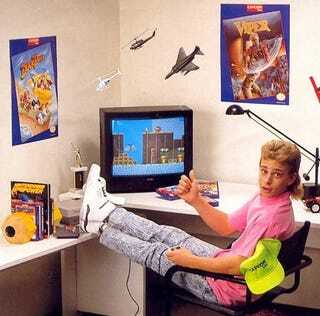 A picture of me being awesome at video games and totally not an old NES ad. A few days ago, I played Super Mario Bros. for the first time. I beat it without dying once in under an hour. Well, at least, that’s what my NES Classic thinks. In reality, I probably died, without exaggerating, over a thousand times over the course of six hours, more or less. But let’s get this out of the way first: Yes, I own an NES Classic. No, I did not pay a scalper/ steal/ give my soul to the devil to get it. I just got lucky. I thought for a while, and- eh, who am I kidding, I thought for one fraction of a second. If you only play one game from the NES in your entire life, what game is it going to be? So after switching out HDMI cables like mad, moving the couch mere inches away from the TV to reach the short cable on the controller, and literally using the Wii U’s USB port as a power source (so I had to have the Wii U on while I was playing the NES Classic) I finally got classic mario up on my big TV screen, and it was glorious. You see, I’m not bad a video games. I swear I’m not! But there’s something about 2D platformers, old or new, that make me want to scream in frustration, mainly in myself. I don’t know if it’s because I grew up in the GameCube age where the 2D platformer was becoming increasingly rare, but regardless, that part of the brain, the medulla platformgota, is completely missing from me. And when you die over, and over, and over again, doing the same levels repeatedly, you start getting bored. Not only that, but the levels, as revolutionary they were for the time, are kind of similar throughout. I got excited every time there would be an underground or underwater stage, but I was shocked to realize that those levels were few and far between. And I loved the castle stages too, but every time I got a game over I would have to do the same game over again up to that point. And I realize that this is the pattern of NES games. Even the best of the best, like Shigeru Miyamoto, couldn’t make a game of any substantial length without requiring the player to repeat stages over and over and over again until they conquered them, and even then, the stages themselves weren’t the most varied thanks to the systems limitations. The Legend of Zelda was the exception with its varied open world, but even then, the dungeons were all quite similar in theme and I remember having to do them over and over again after dying in order to finally complete them. And so, dear internet, I stooped to the lowest level possible: I used save states. Back in the day, the NES was really the only console around. Sure there were the Atari games that came before, and arcade cabinets weren’t as much of a novelty as they are today, but buy-and-large, the NES was all you got. And so, of course people had the time to play through the games as intended, because the games were intended for an audience in which these were the only games to play. One of these kids thinks he’s playing, but SMB is only 2-player in terms of taking turns, not co-op. I am not that audience. Sure, games can now be far longer than the old NES games, but that’s usually not because of insane difficulty, but because of just a whole smorgasbord of content. I know that people still have their Super Meat Boys and Dark Souls, but I’d argue that those types of games are for an audience as patient as the kids from the NES era, if not those same kids grown up. I’m simply not that patient. But guess what? Had I played Super Mario Bros. as “intended,” not only would I have not enjoyed it; I probably would have given up. But by using save states only at the beginning of each stage, I got to enjoy the stages for what they were, still requiring at least a little bit of skill. A little. It still was ultimately boring enough to the point where I had to put on a podcast or music to keep me entertained, but that’s just the side-effect of a society that’s so intent on constant novelty as entertainment. I did ultimately use save states mid-level for the last two stages, because, seriously, f*ck stage 8-3. I thought 8-4 was cool and had puzzles that were intuitive, unlike many from The Legend of Zelda for NES, but it was ultimately too hard for me without them. Nevertheless, I enjoyed my time with Super Mario Bros., and I feel more educated as a gamer after having played it. The game introduces most of the game’s mechanics within the first world, and the following seven are variations on a theme ingenious for its time yet simple in hindsight. It’s simple fun where the challenge lies not in constantly learning how to overcome new obstacles, but how to overcome the same obstacles placed in different ways. With the game being playable on NES, SNES, GameBoy Advanced, 3DS, Wii, Wii U, and of course, NES Classic, you have no excuse not to play this integral piece of gaming history. But you do have an excuse to use save states.